Update: Some people have suggested this might be CR gas. It is not confirmed but we are looking into the possibility. DM or CR at a rough guess. But powder is external to canister. Could be anything from flower of sulphur to mustard powder. That’s powder NOT gas! IDing is useless from the image. Needs taking to a independent chemist. Thanks for commenting. 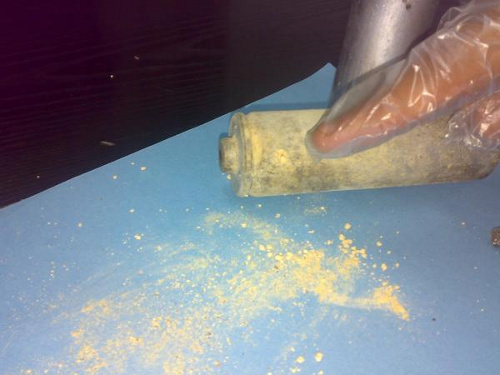 Its powder outside the canister, but “could” be gas if treated differently i.e heated..or what not. Agree that one can not ID from a picture. But it is a start, and its useful as a point of reference.